I have obsessive compulsive disorder of the worst kind. As I lay here working in bed on a Saturday morning, there is laundry to put away, kitty litter to clean, etc....there is prob a dirty dish in the sink. So, when I claim that I have OCD, it is selective. The worst OCD I have is in my work life. I actually think that this is a good thing because it keeps me incredibly organized, and streamlined. I am constantly trying to find different ways to simplify my work process. If nothing else, prob a part of me wants to work smarter not harder. Who wants to wants to work harder, or more? Not this girl. Flipboard is a RSS platform that is gaining a ton of popularity. It has replaced many a Google Reader and has hit almost 90 million users. 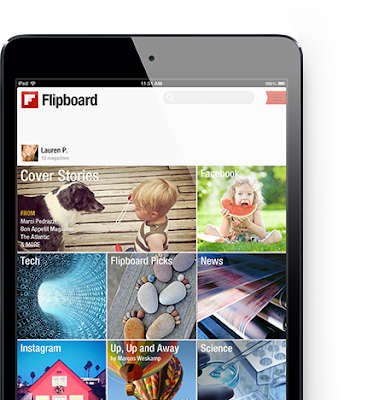 From Wikipedia, Flipboard is a social-network aggregation, magazine-format application software for Android and iOS.It collects the content of social media and other websites and presents it in magazine format and allows users to "flip" through their social-networking feeds and feeds from websites that have partnered with the company. It is primarily used for your iPad or iPhone but there is a Flip It widget that you can add articles from your PC. As an information reading junkie, I found Flipboard to be a little overwhelming at first. I would really love the opportunity to put all my subscriptions into a magazine I choose and let it populate automatically instead of having to do it manually. This morning, with very little coffee, I found a good work around that will give me one magazine with all the sources that I want in it. Using Twitter lists, I have created a list of all the Twitter accounts that I want to follow and then made a magazine from the account section of Flipboard. In hoping that the sources that I choose are savvy enough to push the content that they write to Twitter, I should be able to capture most of my information in one place. I also will be able to adjust my social feeds and weed out subscriptions that are not working for me. What are your experiences with Flipboard?